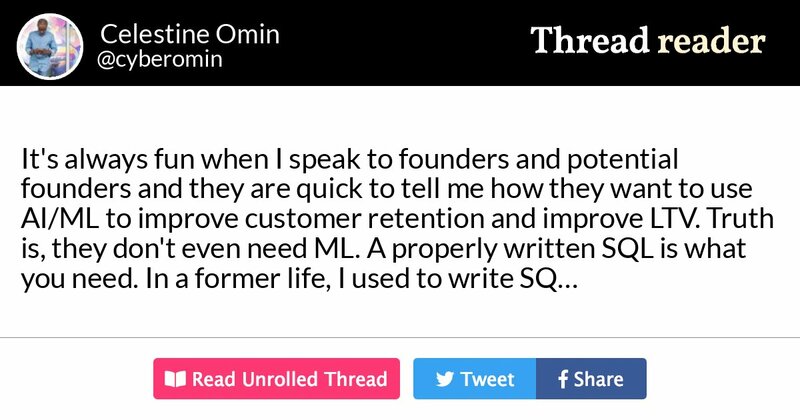 It’s always fun when I speak to founders and potential founders and they are quick to tell me how they want to use AI/ML to improve customer retention and improve LTV. Truth is, they don’t even need ML. A properly written SQL is what you need. In a former life, I used to write SQL to extract customer of the week. Basically, select from orders table where basket size is the biggest. We will then email a nice thank you note to this customer and attach a small coupon/voucher…. …Guess what? 99% of these people became repeat customers. We never needed ML. We just wrote a simple SQL and got this information. We did the same thing for customers who last shopped 3 or so months ago…. …I will write a query like select from order table where last shop date is 3 or greater months. When we get this information, we will send a nice “we miss you, come back and here’s X Naira voucher” email. The conversation rate for this one was always greater than 50%.